Flick Haigh and Jonny Adam after winning the race. British driver Flick Haigh was the only woman in the field when she drove in the first race of the British GT Championship season on April 2, but she didn’t need to be picked out of a crowd of cars—she and her co-driver were out front pretty much the entire time, from winning the pole to finishing the race first. The race was during British GT’s Oulton Park International weekend, at Oulton Park circuit in England. British GT has two main classes, the top GT3 class and secondary GT4, and both had two races on the schedule in the season opener at Oulton Park on Monday local time. Haigh competes in GT3 with co-driver Jonny Adam, and they won the first race overall by nearly half a minute. 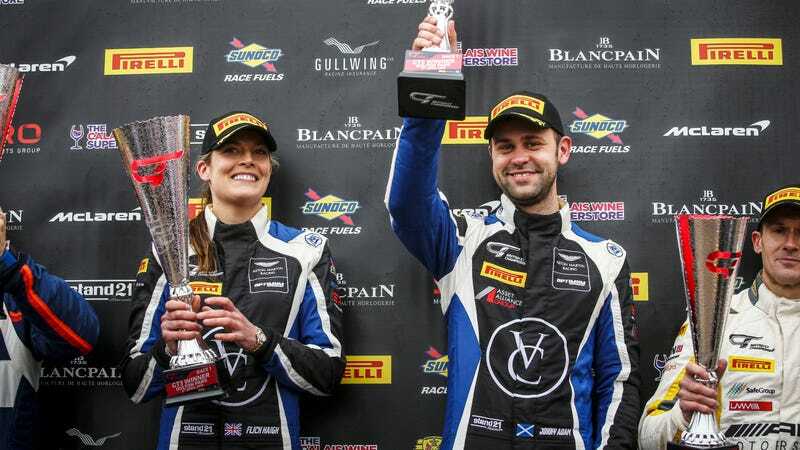 The two classes are why “overall” is important here—Jamie Chadwick became the first woman to win the British GT Championship in 2015, winning the GT4 title and two races that season. She raced an Aston Martin V8 Vantage GT4 that year, and became the youngest driver to win a championship at 17 years old. Flick Haigh and Jonny Adam’s No. 75 Aston Martin V12 Vantage GT3. After becoming the first woman to win an overall pole in British GT Saturday, Haigh started the race for her Optimum Motorsport team in an Aston Martin V12 Vantage GT3. A race report says she got out ahead of a pack of 13 other GT3 cars on the start and stretched the lead to nearly 7 seconds, but that a Lamborghini Huracan driver behind her had closed the gap to about half of that by the time Haigh and Adam made a mandatory driver swap after 25 minutes. Adam came out of the pits and battled the Huracan until it hit another car in lapped traffic, messing up its wheel. Adam and Haigh’s V12 Vantage ended up winning the race by more than 28 seconds over the next car. Haigh and Adam were supposed to start second in the next race, but the British GT Twitter account tweeted that Adam damaged the car on the way to the grid. Rain cut the day short anyway, and British GT decided not to award results for the second race. Because of that, Haigh and Adam lead the championship standings by seven points over second place. Update, April 5 at 9:38 a.m. British GT sent out a press release Thursday, saying race stewards decided to award full points and finishes for the rain-shortened second race. That brings Haigh and Adam down to fourth in the standings after the mishap at the start of the second race.